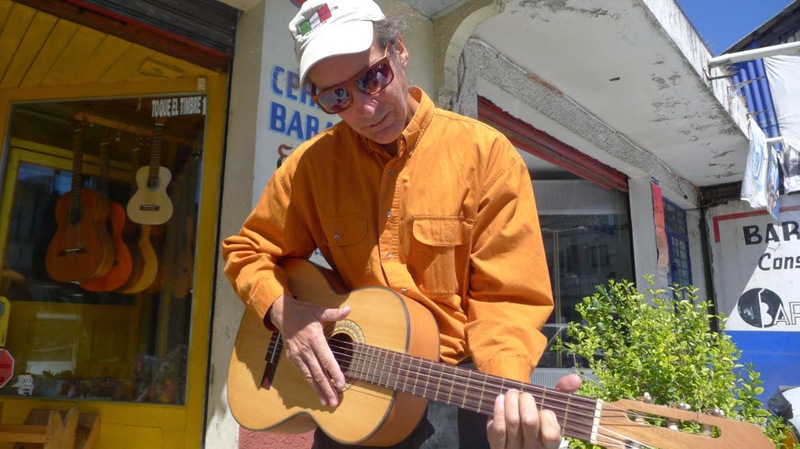 Guitar Fest in Zihuatanejo was a pleasure. Next year we vow to arrive early and sign on as volunteers so we can see all the shows and play more of a part of this magical event. 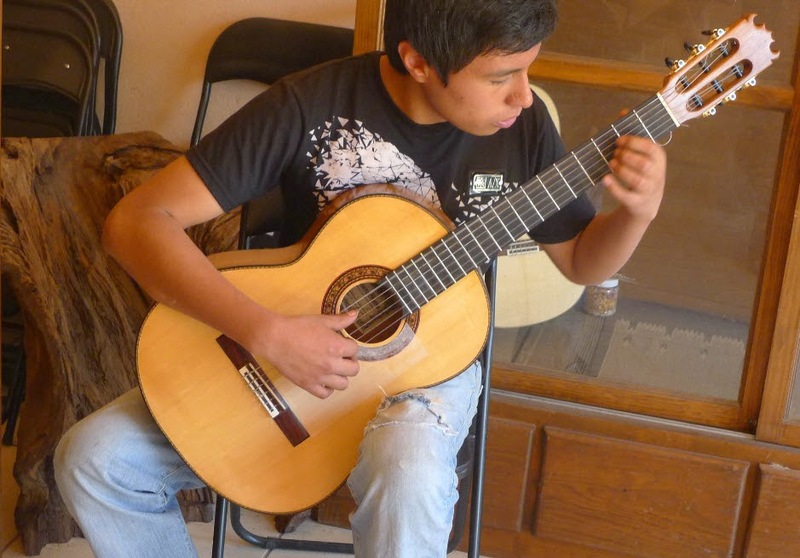 At the Festival, we saw representatives from the town of Paracho in the Mexican state of Michoacan who had a booth selling hand- made guitars. Dan and Kathy from the ketch Lungta suggested we join them and travel overland to visit Paracho by car. We decided to join them as did two other couples, Bob and Sherry on Nirvana, and Rick and Brenda on Dad’s Dreams. 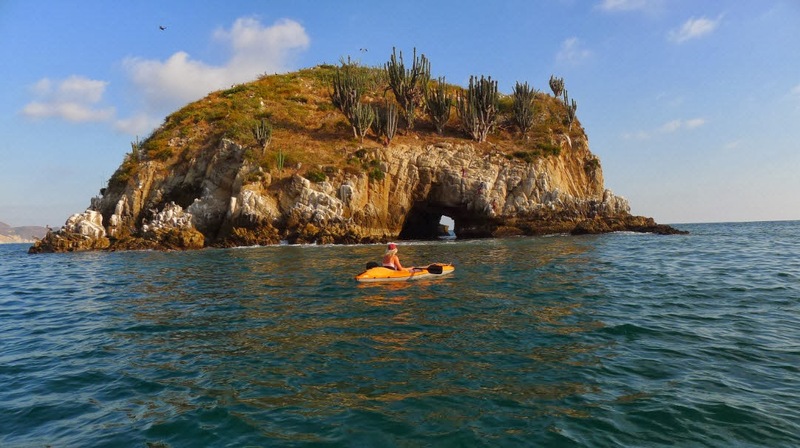 So we checked our anchoring ground tackle, buttoned up the four boats at anchor in Bahia de Zihuatanejo, and headed inland in two rented cars. Since the anchors had been down for two weeks we considered them well “soaked” and trusted them to hold. A weather forecast for mild winds gave us more confidence in our boat’s safety. We drove northwest to the Autopista then turned north up the Balsas river valley crossing from the state of Guerreo into the state of Michoacan. We made good time on the toll road and soon found ourselves near the town of Nueva Italia where we saw numerous Federales in black riot gear lining the sides of the Federal highway. 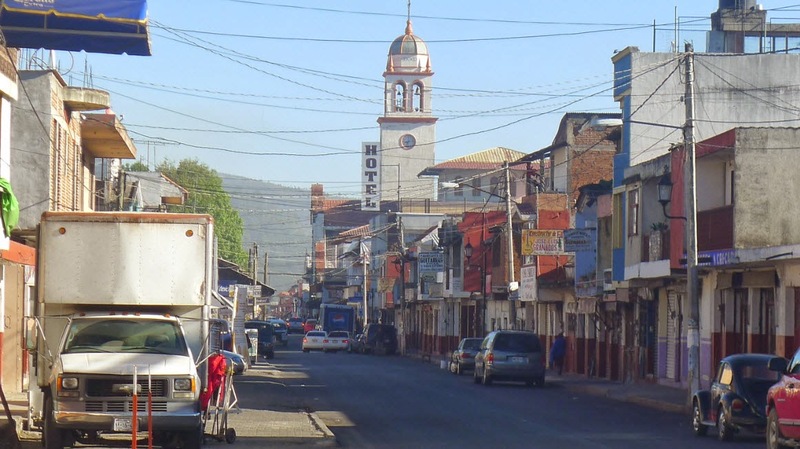 Of course I had checked the web for information about towns on our route and had read the U.S. state department’s travel warning for the state of Michoacan and specifically the area around Nueva Italia. But it was daytime and we were on a controlled access roadway so we weren’t too worried about it. Here is what I had learned: The Knights Templar cartel has been fighting the New Generation cartel for control of criminal activities in the area. The police have stepped back and taken no action (probably because they were part of the problem). 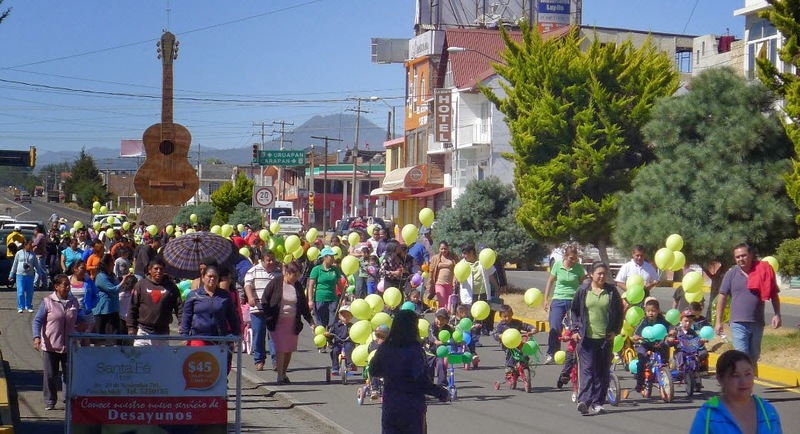 Locals in Nueva Italia, and other nearby towns have banded together to form self-defense groups or community police to do what the police cannot or will not do, force out the cartels and restore law and order. Thus the Federales stayed out of the towns and clustered along the federal toll highway, the Autopista, containing the conflict to the countryside. We drove north, choosing not to stop in scenic Nueva Italia, a small town founded by Italians in 1908 . An hour north, in Uruapan we got off the Autopista and eventually found Highway 37 which climbed up into the hills to the small town of Paracho. We checked into the Santa Fe hotel, one of three in town. Rick went looking for a liquor store to get ice for the cooler, Dan searched for a restaurant, Bob got on the internet to find the most famous guitar makers in town, and Scott and Connie just stood in the hotel room taking in the sheer grandeur of it. Tile floors, a balcony, a big bed, and amazingly, a bathroom with a shower and hot water! 350 Pesos, about $30 USD. And this, Hotel Santa Fe, was the fanciest hotel in town. Rick found ice and Dan found the ONLY restaurant open after dark. We had dinner then made an early night of it. Ummmm Showers! Ummmm big bed! Oh my Dog, TV and the movie Zoro! The next day was interesting, fun and a little bit odd. 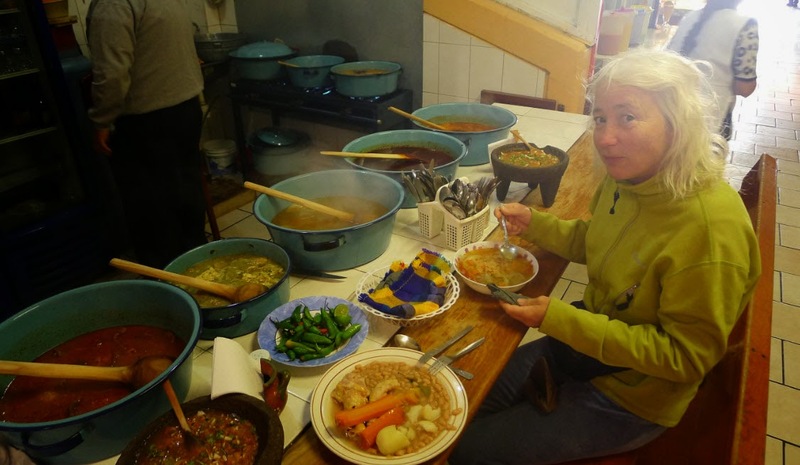 Connie and I started out by walking to the Mercado where we found a soup booth where the gal had 8 big pots of various kinds of soups setting on the counter or bubbling on the stove. Connie had the chicken broth base soup with vegetables and some strange ground pork balls with fresh mint, yerba buena. I had a meat based soup with veggies and chicken parts. Of course she gave me the chicken foot, my least favorite part of the bird. 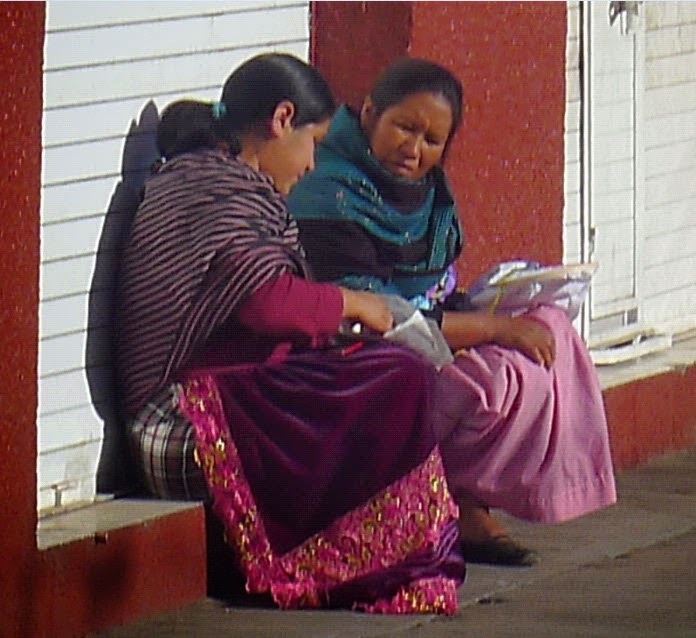 We sat on a bench alongside the locals, many of whom were dressed in the bright colored traditional garb of the P'urhépecha natives. She would rotate the pots from the stove to the counter, replacing the ones cooled with the hot ones from the stove. 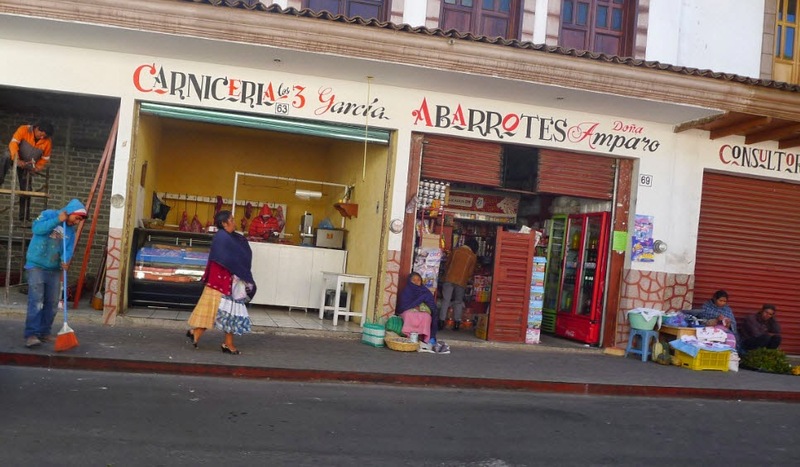 Around us were many such small booths with their specialty foods, many of which sold chopped port by the kilo or on fresh tortillas. Workers came through buying bags full of cooked foods to take with them on their way to work or stopping for a hot breakfast soup. 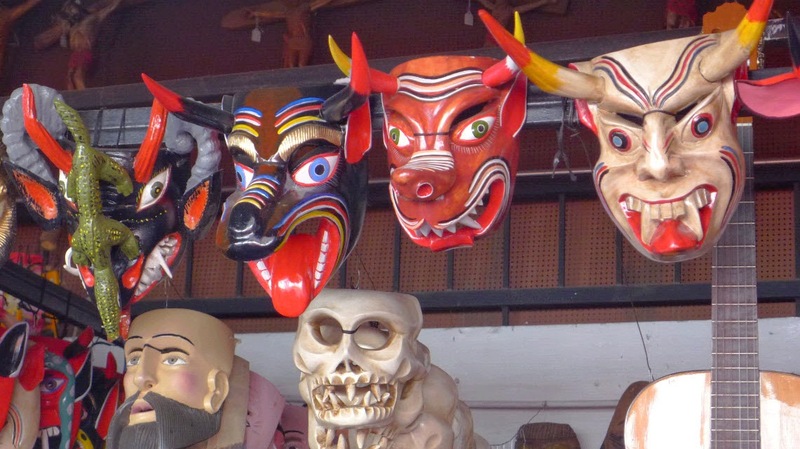 The Mercado was a working market, not a tourist market and we were the only gringos there. Behind the food booths stretched the vegetable market with produce laid out on tables. Next door were the cheese and butcher shops. 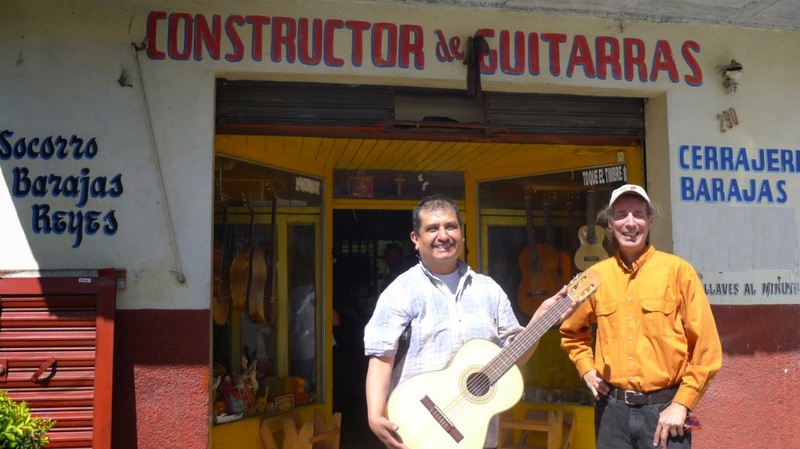 Thus began a day of wandering around Paracho, visiting the many guitar shops and the luthiers, makers of string instruments, in their workshops creating beautiful stringed instruments from pine, mahogany, spruce, ebony, rosewood, aguacate (avocado), koa, and maple. Walking down the street we ran into two young men who asked if we were here to see guitars. They led us to their father’s shop who just happened to be a famous guitar maker that Bob had researched on the internet. They had three guitars on display in the sparse storefront. To our great enjoyment, the young son played one of the beautiful instruments in a flamenco style. Then the father came down from his shop and greeted us and invited us upstairs to see where he did his work. He led us up two flights of rickety iron steps to a loft workshop full of wood shavings and wood working tools. We had a wonderful time talking to this artist about how he made is instruments and about the famous musicians who hired him to make their custom guitars. Nice! 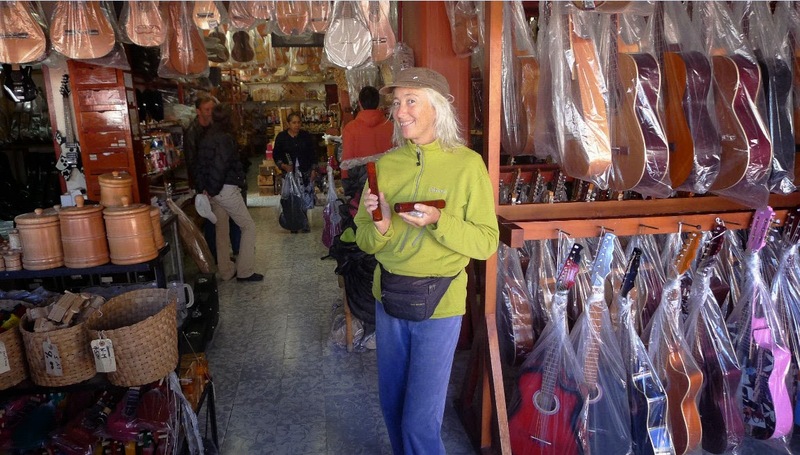 With four couples wandering the streets, visiting shops, and talking to luthiers we were lucky to escape the trip buying only two guitars, one mandolin, and one violin, plus some cases, strings, picks, and percussion instruments. We met back at our only open restaurant for another four course dinner and talked about our day, comparing our different experiences. Dan had found a guitar shop where the proprietor had only partially finished guitars on display. They agreed on the fretting and tuning pegs to be added and the luthier finished the work for Dan later that day so Dan truly had a custom guitar. Bob found a mandolin at a large shop at the end of town that had good sound and great action. He spent hours looking through their immense inventory and tuned multiple mandolins before selecting the one he wanted. I found a discounted guitar in the shop of Ignacio Barajas Caro. He had taken it out of the storefront window where it had been on display for a long time. The woodwork on the front was discolored from the sun and there were some scratches on the front where someone had hit it with a guitar pick. I offered him less than the asking price and he smiled and said that my offer was a good offer but no. I offered him more. He complemented me on the offer again and nicely declined. Then he tuned the guitar, sat down, and played some beautiful music, smiling all the while. I hemmed and hawed and decided to sleep on it to the morrow. Day three, we checked out of the hotel and I visited the luthier on the end of town. Their inexpensive guitars were pretty but just didn’t have the sound or the presence as Ignacio’s. So Connie and I returned to his shop to find it closed. We wandered around for a while then came back as he was just opening up. He smiled graciously and I handed over 750 pesos, his full asking price. Then Ignacio cleaned it up for me and helped me select a case for it. Bob and Sherry saw us and came into the shop where Bob found a wonderful little violin, hand made by Ignacio. As the mandolin and violin have the same tuning Bob is looking forward to experiencing both instruments. We took a group photo at the entrance to town, the eight of us standing under the fifty foot guitar in the middle of the street. Then we headed south back down the hills to the town of Urapan. There we took a wrong turn and ended up on tiny cobbled streets. We got separated from the other car and found ourselves south of town on the Libre road, not the toll road. This road led us south towards Nueva Italia! Entering a roundabout we took the turn to connect with the autopista and right away ran into a roadblock. The road had large rocks placed in the center so we had to get off onto the shoulder. Metal pots blackened by kerosene lined the sides of the road. Nighttime flares I supposed. Then we came to a sandbagged square manned by young men wearing matching tee shirts. We had found the local militia men! A nice young man spoke passing English and questioned us about our business. I showed him the contents of the trunk and the guitars we had bought in Paracho. He waved us on. There were no uniformed police or soldiers in sight. Down the road we found the entrance to the autopista. I incoming ramp was barricaded closed and guarded by a dead dog laying stinking on the street. We drove further till we found some locals who suggested a circumstous route to another autopista entrance. Not wanting to spend much time driving around a disputed territory we returned to the closed autopista entrance and Connie and Rick walked up the closed ramp to talk to the attendant. “We have to get on this road!” The attendant then let us drive onto the autopista using the off ramp. Saved us 56 pesos! Once on the federal highway we passed dozens of flak jacketed, baklava wearing, federales with machine guns and shiny trucks keeping the highway safe from the local militia. We felt a little less secure there on the autopista so we put the petal to the metal and hoofed it back to Zihuatenjo arriving just in time to check the rental car back in at the airport and arrange a ride back to the pier. All four boats were right where we left them there in the bay. However, our neighbors had left. The bay had emptied out after Guitar Fest had ended with everyone flocking north towards Barra de Navidad. We provisioned the boat and headed north also, our boats starting out together then getting separated along the way until Traveler was alone sailing into the night, Connie playing her ukulele and me admiring my new-ish guitar from a lovely luthier in Paracho. 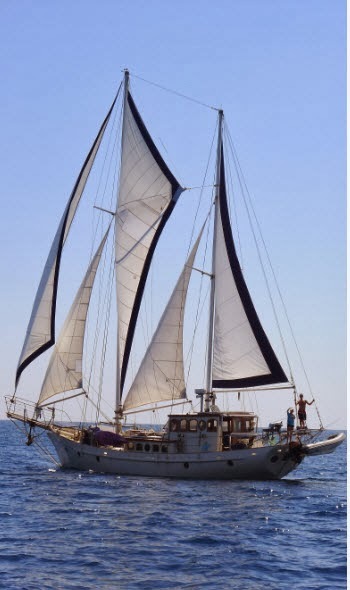 As I write this we are in Bandaras Bay anchored at La Cruz. We had stopped here so I could take the HAM radio exam but the test is cancelled because of a big regatta this weekend. 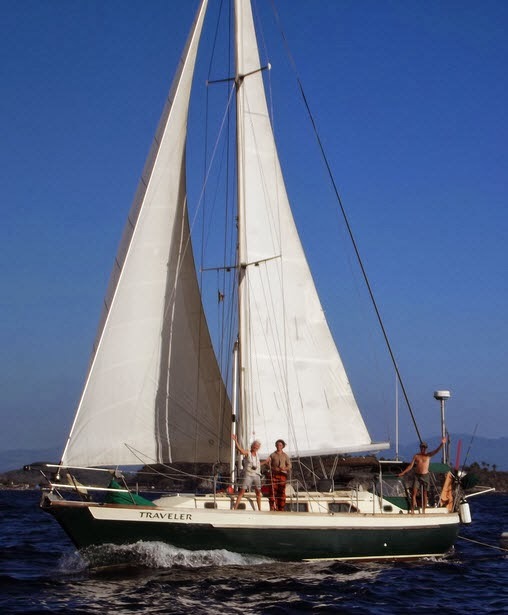 Dan and Kathy on Lungta are south of us trying their best to sail instead of motor. Rick and Brenda on Dad’s Dreams headed south to Apaculco. 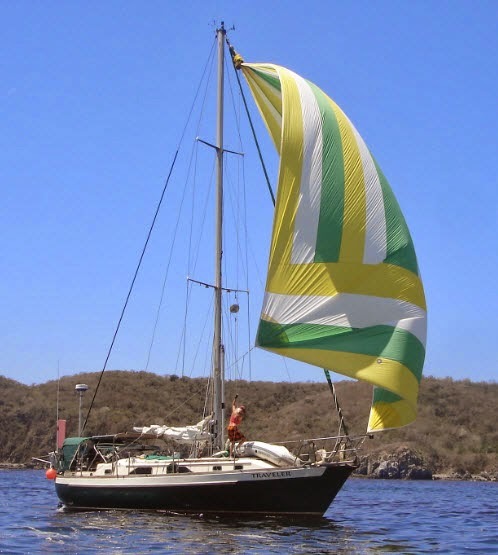 Bob and Sherry are still in Barra de Navidad waiting for the north winds to calm down. Meanwhile he’s trying to decide which instrument to play. We head to Mazatlan on Monday buddy boating with Lane and Vicky on Adesso. In Mazatlan we’ll leave the boat for a quick trip by car to Phoenix to pick up our new water maker and to get our six month visas renewed. Then after driving back down to Mazatlan we’ll take some friends on board to help with the crossing over to the Baja peninsula where our first big stop will be the lovely town of La Paz. 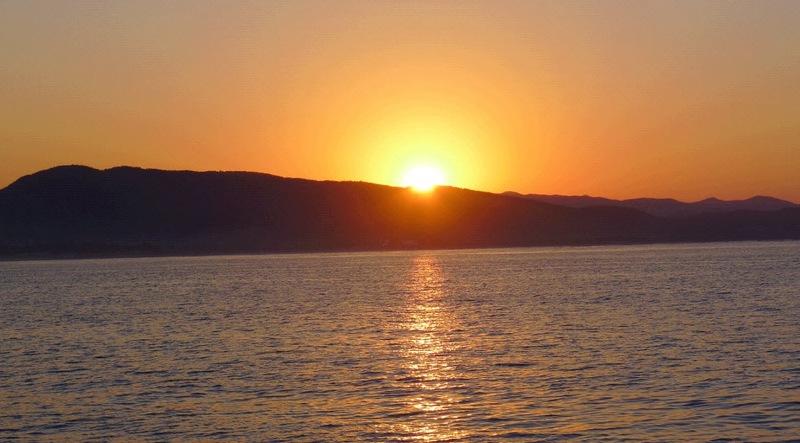 And from there we head north into the Sea of Cortez. Stay tuned! Alphonso, with a sucker in his mouth, and Connie with a smile on her face. 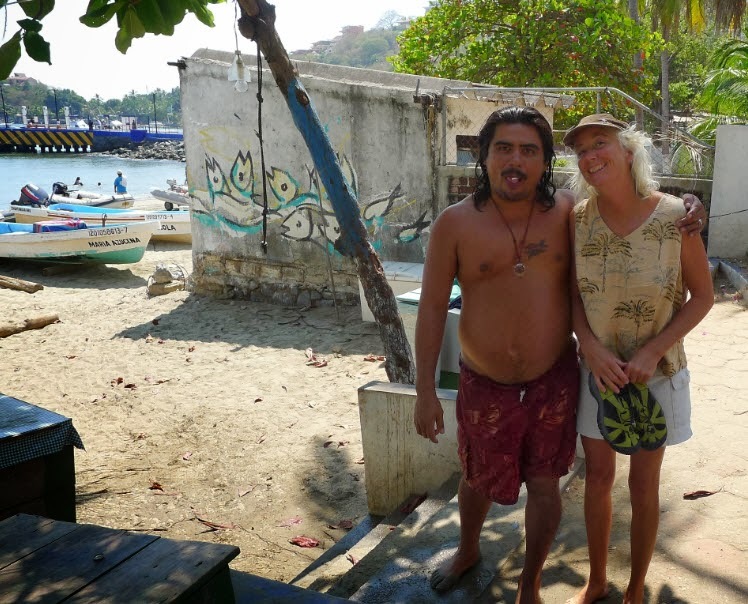 who safely sees us in through the surf, hauls our dinghy ashore, and watches over it while we stroll the streets of lovely Zihuatanejo. Ten pesos for the service. 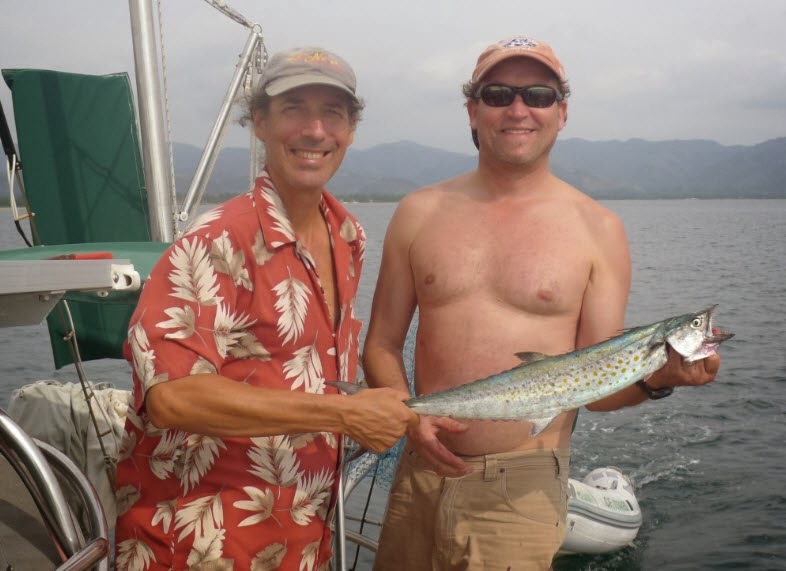 After dropping off Scott and Karen Tobiason in Barra de Navidad, Connie and I cleaned the boat top to bottom, did laundry, reprovisioned, and headed south down the coast, buddy boating with our friends Kathy and Dan on Lungta and Brenda and Rick on Dad's Dreams. 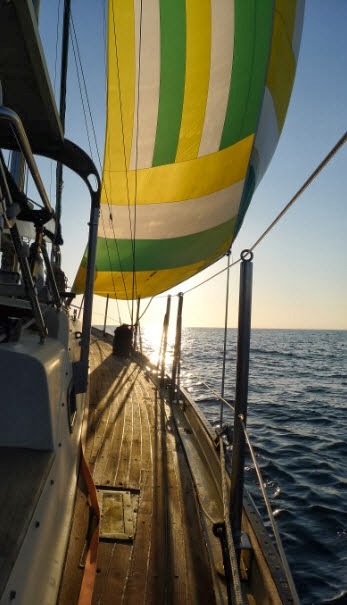 With the stops few and far between it was a tiring voyage of four days but also delightful as the seas were manageable and the winds light. We motored about 8 hours of the 50 it took us to get here. We took two overnight stops along the way and did one overnight voyage at the end of the trip, doing our best to sail as much as possible. 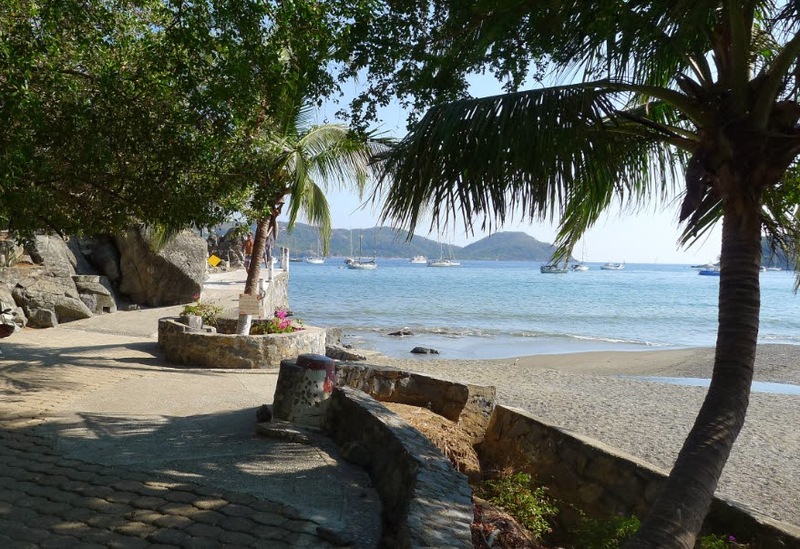 Zihuatanejo is a beautiful little place with colorful houses and small hotels hanging over the bay. The malecon winds around the north portion and is full of people swimming, playing on the beach, or drinking in the little cafes. 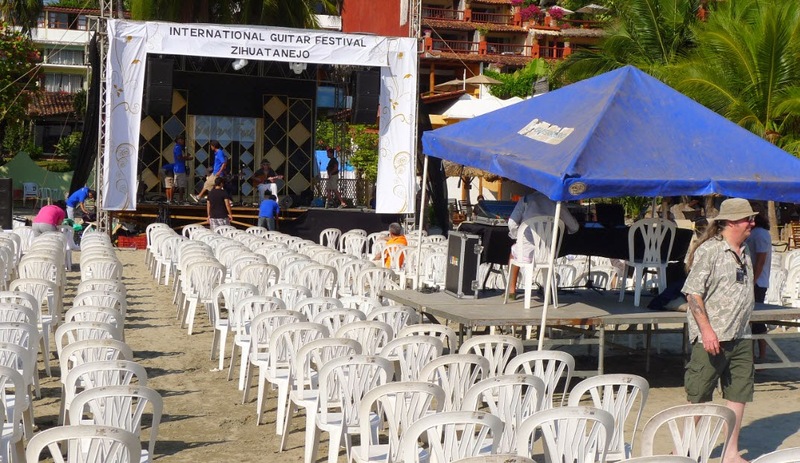 It is a music town and we are here at the best of times, the week of the Zihuatanejo International Guitar Festival. Last night we took the dinghy to shore right on the beach where the festival is held. We timed the landing with the swell and rode the wave right in as we are supposed to. The dinghy wheel hit sand and just as we prepared to make our exit another wave tossed us sideways. Connie threw her weight to port and we stayed upright. Then we walked the dink up the tide line to the edge of the concert grounds and left her there by the gate. The show was enormous! Thirteen acts with three songs each introduced us to the musicians who will be playing all week. We took third row seats and stayed from 6:00 til 10:00. Amazing talent. At 10:30 we launched the dinghy into the surf, skewed sideways, tried again and made it off successfully. We were amazed to find ourselves getting to bed AFTER midnight for once. Late night carousers for sure! Yes Connie paddled through it! We are in for a treat this week, I know. Tonight we go back to the beach, this time letting Alphonso take care of us, and we'll hear three musicians give us a little more of their repertoire. 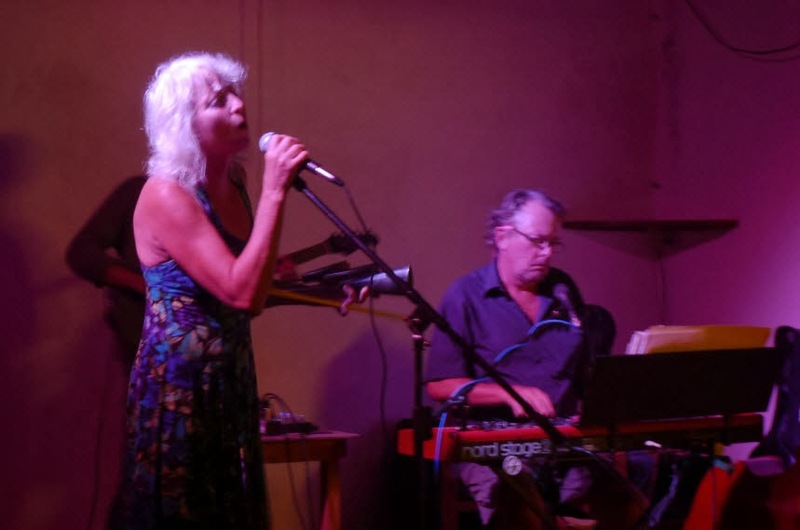 We found out that after the concerts many of the musicians retire to Jose Luis Cabo's bar and play late into the night. So tonight after the show at the beach we will make our way to El Canto de la Sirenas and see if we can break our "staying up late with the adults" record. Can I go til 2:00 AM? We shall see. It was great to have visitors recently. We will be ready for more visitors in a week or two so if you've got a hankering to get out of the cold, send us a note, use the credit card with Alaska Air, and get your butts down here where the water is warm and so is the beer. 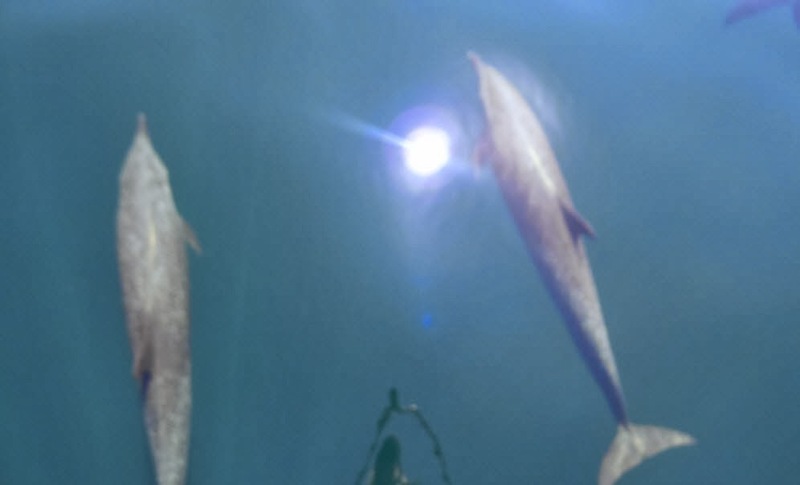 Looking down into the water while dolphins play in the bow wave.